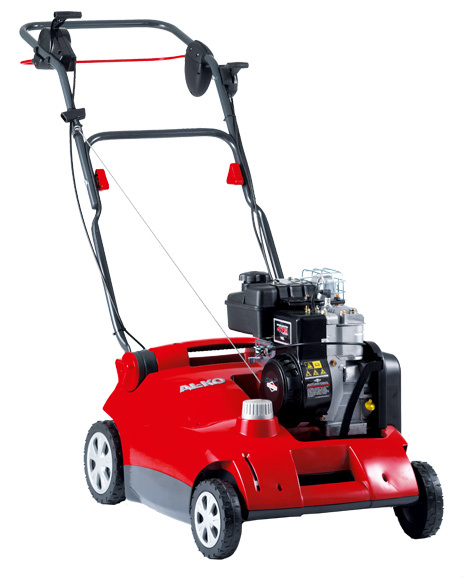 With its high-performance 148cc / 2.2kW Briggs & Stratton four-stroke engine freeing the operator from the restrictions of a mains-cable, the German-designed Al-Ko 4000VB is ideal for those maintaining a larger lawn (it has a 40cm working-width). The engine powers a set of 17 stainless-steel scarifying knives, which will pull out any thatch accumulation, thereby making it much easier for sunlight, oxygen, micro-organisms and essential nutrients to reach the all-important root-network. The six-stage working-depth is dial adjusted, so it couldn’t be easier to select you desired blade position. The Al-Ko 4000VB Petrol Scarifier comes equipped with a capacious 50-litre collector, so you won’t have to rake-up any debris that might be left on the lawn surface. It sits on smooth-running ball-bearing mounted wheels and weighs just 33kg, so it couldn’t be easier to push; and it features a safety-enhancing ‘deadman’s handle’, which ensures the engine stops when the bail-arm is released.